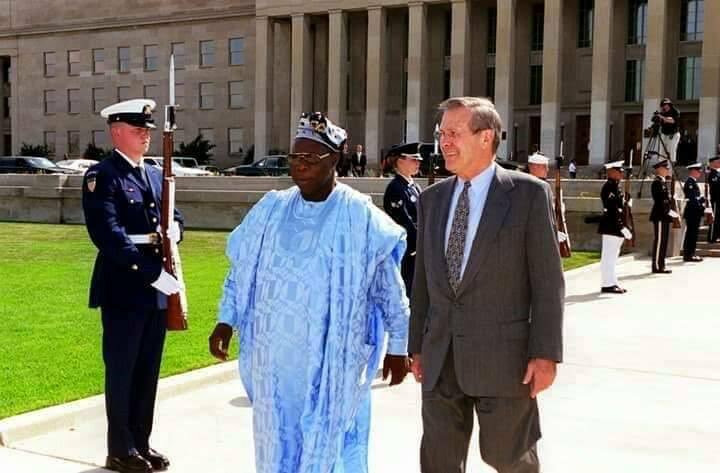 Ex President OLUSEGUN Obasanjo Appointed Chairman of World Ex-Presidents: Mathew Olusegun Okikiola Obasanjo Appointed as the new chairman council of world ex-presidents. Baba Iyabo/OBJ records as the first African to be appointed at the 32nd annual plenary meeting of world ex-presidents in Newport, United Kingdom recently. He takes over from Franz Vranitzky who was a former chancellor of Austria from 1986-1996 before he later became chairman of world ex-presidents chairman on 1st July 2010 and served till June 2015. Meanwhile, JOINT MILITARY EXERCISES with our allies in South Korea were "too expensive." They act as a deterrent to North Korea, China and Russia, and are essential to ensure preparedness with our allies should Kim Jong Un launch an attack. #REMINDER: The Trump Administration's position on the suspension of joint military exercises with South Korea was CONDITIONAL. The annual August exercises were suspended...AS LONG AS North Korea acted in "GOOD FAITH" in working towards denuclearization. North Korea is ACCELERATING their nuclear program, continuing missiles production, and hiding assets from the U.S..
From there, Pick the #candidate who is most likely to treat #humans as #humanbeings. I like #Polis. I like #Kennedy. I can only have 1.
but they both see me as a human. There's no extra choice to this. The GOP governor candidates have made their stances that some humans are better than others. That's how I pick. After I'm done hoping for the best, I will work with the rest. I just find it's really hard to work with a candidate's "promises to protect blah" when they could care less about the people who inhabit the area. @IDFSpokesperson admitted: #GreatReturnMarch is Palestinian PR success. But soldiers killed 100 protesters & nothing changed in Gaza. Israel says Hamas doesn't want war. but more shots were fired at Israel than since the protests begun. No casualties reported on the Israeli side. Several targets connected to the #IRGC & Hezbollah attacked by Israel. Syrian media claims dozens of Israeli missiles were intercepted. There are reports of casualties in Syria.